Not seen in London for over fifty years, Lionel Bart’s “Maggie May” runs the danger of feeling dated or hackneyed. A modern-day audience can be forgiven for reasoning why it hasn’t been staged for so long. Admittedly it is not one of Bart’s finest, and Liverpudlian Alun Owen’s book has lumpish limitations; but Matthew Iliffe’s revival papers over the cracks and compels us to shed our doubts. Walking into the Finborough is like wandering onto the set of a 1960s Ken Loach film. We are very much taken back in time as Verity Johnson’s suitably monochrome set recreates the gritty realism of a bygone age. You can almost taste the salt air of the Mersey and feel the fabric of the working-class nobility worn bare. Against the backdrop of dockside gantries and Scouse defiance is the tale of the doomed love affair between the eponymous prostitute, Maggie May, and Pat Casey, the son of a union martyr. Yet much of the plot concentrates on Casey’s fight against his corrupt bosses to prevent a shipment of arms to South Africa. An odd choice for a musical, and indeed often the music is at odds with its subject matter. It boasts ‘one of the most musically diverse scores’; which is true, in a sense, of this motley crew of numbers if you substitute lack of focus for diversity. There are obvious Celtic roots, but we are taken on a whirlwind tour that takes in Mersey Beat, music hall, rock ‘n’ roll, folk, ballads, a bit of blues and even some ‘hot jazz’. I must say it was a touch surreal at one point to see a burly bunch of dockworkers with jazz hands. Sam Spencer-Lane’s choreography is equally eclectic but works impressively well within the confines of the theatre’s space and there are some firecracker routines hemmed in just sizzling to explode onto a larger stage. The thirteen strong cast almost move as one with a collective personality that braces any weaknesses in the libretto. And despite some patronising patois, the dockers and the whores avoid caricature. Kara Lily Hayworth commands the stage with her presence as the tough, no-nonsense but brittle Maggie May. A popular dockland prostitute, she calls all her clients ‘Casey’ after her childhood sweetheart. Pat Casey returns from a life at sea and their attempts to rebuild their lives together is a rocky road, particularly when Casey gets reluctantly drawn into the dockworkers conflict. James Darch wonderfully exposes the inner conflicts of the man; torn between love and principle, and unable to shake off the shadow of his past. While Lily Hayworth’s strong soprano has the lion’s share of the show’s stirring ballads, Darch contrasts with a memorable rendition of “I’m Me”: one of the musical highlights. 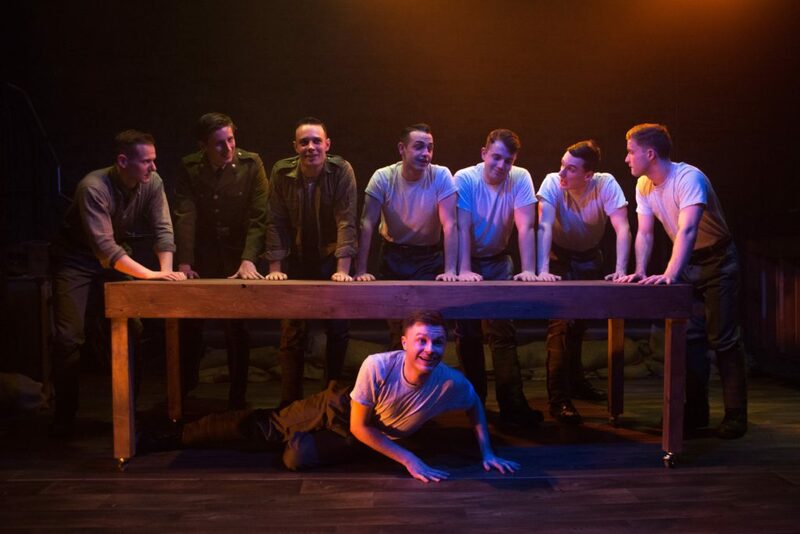 The ensemble numbers tread a more uneven path, veering from the shambolic, tuneless bar-room singalong of “Right of Way” to the richly textured, Kurt Weill inspired “Casey”. Despite Henry Brennan’s dynamic piano accompaniment, I did find myself craving a double base, or a touch of actor-musicianship. But that is just a subjective cavil, and could dilute the acting, which is consistently fine throughout; from Mark Pearce’s self-assured swagger of corrupt union boss, Willie Morgan through to the show-stealing charisma of Michael Nelson’s Judas figure, Judder Johnson. But like the characters who are shouldering life the best way they can, it sometimes feels like the actors, too, are trying to make the best of what they are given. Yes, there are often reasons why a show isn’t staged for over half a century. However, if this is a charge that can be levelled at “Maggie May”, then this company makes a watertight counterclaim and gives us every reason to catch this revival at the Finborough.